In the heart of downtown Pawhuska, you will find a uniquely beautiful five-story triangular building resembling the famous Flatiron Building located in Herald Square in New York City. As early buildings in Pawhuska were constructed, a triangular piece of land was left in the middle of town. For many years, this land was used as a park with a two-story bandstand in the center, but in 1915 a five-story “flat-iron” building was constructed on the triangular piece of land. During the Oil Boom, the building housed over 100 lawyers and other commercial businesses including jewelers, beauty shops, tobacco stands and doctor offices. The Triangle Building was built by Charles Gray who would also become the first individual to inhabit the space. He conducted his legal business here for over 60 years. Gray recalled those years as a time when “everybody chewed tobacco” and the sod streets of downtown Pawhuska were filled with horse-drawn “cabs.” Gray did not remain alone in the building for long, and soon welcomed a new partner into his firm in 1920 with Bill Palmer. The firm was called Gray and Palmer – Attorneys and Law. Gray later welcomed J.B. Tolson, the father of Pawhuska’s Ralph S. Tolson, into his building with his company called The Tolson Agency. The Tolson Agency is still located in downtown Pawhuska, but is now just right across the street. The Beginning Built in 1912, the Triangle Building was constructed as a low-rise, five-story building comprised of brick, concrete and steel rose. This Chicago school “Renaissance” architecture, with Art Deco elements, was home to many local businesses. The main door of the Triangle Building showed the early influence of Art Deco ornamentation that would soon become popular in neighboring cities—including Tulsa. The landmark is famous for being the first fireproof building in Oklahoma and only one of five in the United States in the early 1900’s. Renovation During the Oil Boom, countless business deals that would shape Oklahoma history were all made at the Triangle Building. However, like many downtowns in Oklahoma’s history, Pawhuska’s downtown began to die as the oil businesses’ success took a fall in the early twentieth century. Eventually, the Triangle Building closed its doors and has remained dormant until is recent rebirth. Since the opening of The Pioneer Women's Mercantile in October 2016, the Triangle Building has seen new life with a historic renovation. 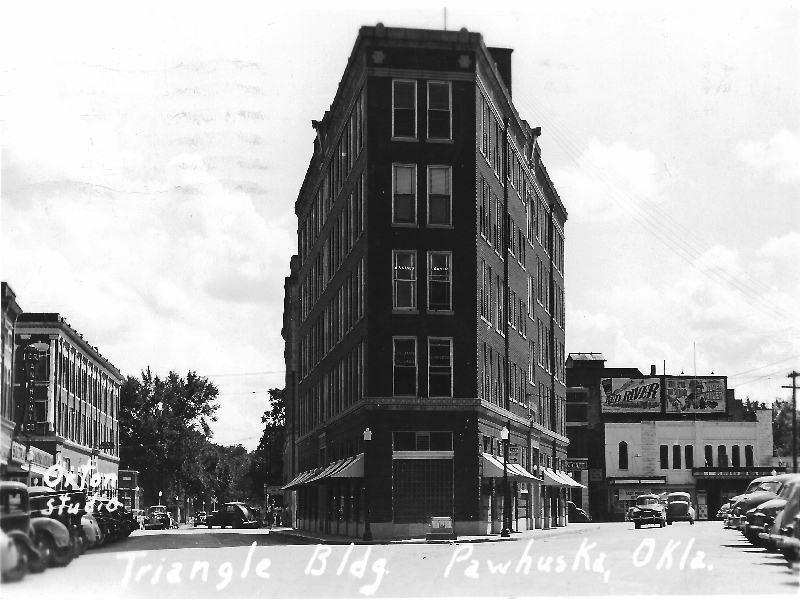 Overcoming obstacles at the state and federal levels, the owners of the Triangle Building began a historic renovation on the Pawhuska gem as they transformed the once crumbling building into a boutique hotel located just across the street from The Pioneer Woman’s Mercantile. Reopening The same family known for renovating the historic Mayo Hotel in downtown Tulsa, among other historic Tulsa properties that kick-started Tulsa’s downtown growth, is also responsible for this historic renovation. They are joined by their partner and local Tulsan, originally from Bartlesville, in restoring the Triangle Building back to its original glory. The partners’ $3 million renovation started in 2017 by turning the old office building into a 20 room historic boutique hotel. Historic renovations are always more complicated and intricate than new construction, requiring close attention to detail in restoring historic features like refurbishing the original marble staircase, entry foyers, hallway corridors and windows. However, that attention to detail has now brought the historic Triangle Building back to life and its original glory for Pawhuska to enjoy. We are excited to welcome you to “hang your hat” at The Frontier Hotel Pawhuska!